E-Prime provides the GeneratePreRun and GeneratePostRun properties (Common tab) to define when object resources are loaded. When these properties are set to TopOfProcedure, the .Load script generated by E-Studio will occur at the start of the Procedure. This provides the benefit of having all of the objects load their properties at a non- time critical portion of an experiment. Use of the BeforeObjectRun setting results in the script for .Load being generated immediately prior to the .Run script generation for an object. Objects on a Procedure may individually select this property setting, or the Inherit (default) setting results in inheritance of the property setting from the Procedure. Using Inherit for the property setting permits for easier changing of all object behavior on a Procedure by setting the desired script generation only on the Procedure. Note: When using the TopOfProcedure option in the GeneratePreRun field, [attrib] references for any properties on the objects that are modified by c.SetAttrib calls on the Procedure will update the value of the attribute in the Context, but updates will not be reflected in the Procedure (i.e., because .Load operation for the object has already occurred). 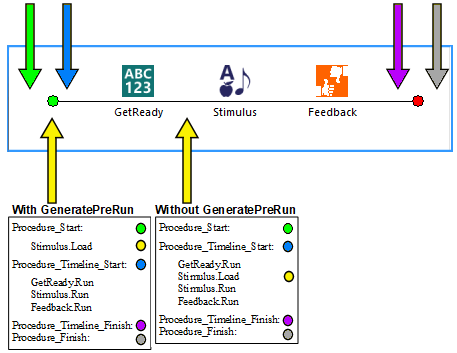 To update properties during a Procedure using attribute references, set the GeneratePreRun field to BeforeObjectRun.